144 Sea Trainees successfully completed the important sea phase of their preparation to be leaders in the Navy, at the First Training Squadron of the Southern Naval Command today. 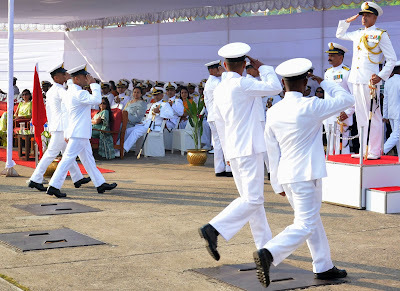 The Passing Out Parade was reviewed by Rear Admiral MS Pawar, Chief of Staff of Southern Naval Command. 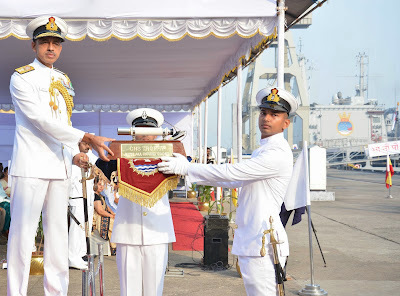 Addressing the trainees on parade, Rear Admiral Pawar reminded them that the sea does not condone inadequate knowledge, lack of proficiency or poor leadership. He also exhorted them to understand each man they command, and know their strengths, weaknesses and aspirations. Fairness, compassion, humility and the ability to lead by example would win loyalty of the men, the Admiral added. First Training Squadron comprising of ships INS Tir, INS Gharial, INS Sujata, INS Sudarshini, INS Tarangini, and Indian Coast Guard Ship Varuna, is commanded by Captain VK Sawhney. The 144 trainees comprised of the pioneer batch of Indian Naval Academy, Ezhimala who completed the Flag Ship B Tech course, trainees from the National Defence Academy, Short Service commissioned Officers, Graduate special entry scheme officers as well as 25 Officers from the Indian Coast Guard. During training on board the ships, the officer trainees gain their sea legs and are introduced to practical aspects of seamanship, ship handling, weapon handling and gain firsthand experience on the rigours of life on board a warship at sea. The Officers also sailed to several foreign ports, which in addition to developing their nautical skills, enables them to cultivate a multicultural and global outlook, essential for the grooming of a Naval officer. Sub Lieutenant Ajit Singh Rana won the Chief of the Naval Staff trophy and Telescope for the best all round officer of the course. Sub Lieutenant Prashant Chandra won the Chief of Naval Staff Trophy and Binoculars for standing first in overall order of merit. Assistant Commandant Anuj Singh Chauhan received the Director General Indian Coast Guard Trophy for the best Coast Guard officer. Sub Lieutenant Rohit Reddy was awarded Flag Officer Commanding in Chief East Naval Command Trophy for maximum progress in various subjects. Sub Lieutenant Shakti Singh was adjudged the best Sportsman.